Alexander Mills from The City Law School has addressed officials in Africa on the subject of corruption, financial crime and money laundering. Alex, who is a lecturer on the Bar Professional Training Course (BPTC), was invited by the Commonwealth Secretariat to speak with directors of public prosecutions and senior prosecutors of anti-corruption and money laundering agencies from across the south and east of the continent. Before joining City in 2012, Alex was a Barrister at 23 Essex Street Chambers where his practice encompassed asset forfeiture. "Money laundering, corruption and the dissipation of the proceeds of crime are multi-national issues. In order to obscure the source of criminal funds, they are passed through different companies, trusts and bank accounts across different countries and continents. The need to have well run organizations and effective mechanisms to tackle such crime is paramount. The 3 days in Gaborone allowed for full and frank discussion and provided an excellent opportunity for prosecution agencies and experts to share best practice". "DPA's are a way for authorities and companies to resolve what would otherwise be long running investigations and protracted prosecutions more efficiently and satisfactorily for all parties. Victims are compensated and criminal profits disgorged. It is also hoped that existence of DPAs will encourage better systems of compliance with anti-money laundering regulations. At the same time, authorities will avoid the need for costly investigations and court time spent litigating such cases will be dramatically reduced". "The need to deal with accusations of back-door deals, budgetary constraints and general corruption, were themes that were raised repeatedly and many saw the new system of DPAs in England and Wales as a very useful tool to deal with those issues". 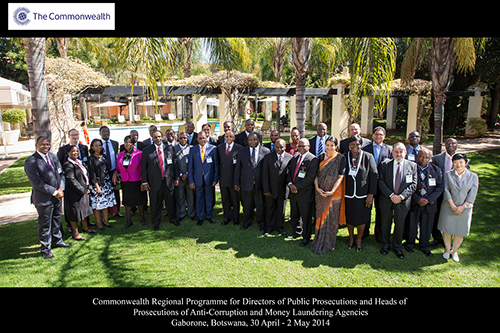 The delegation (pictured above) included Directors of Public Prosecutions from Botswana, Kenya, Malawi, Tanzania, Uganda, Zambia; the Prosecutor General of Namibia, the Chief Prosecutor of Uganda, the Deputy Attorney General of Zimbabwe, as well as Anti-Corruption Chiefs and Officers from Lesotho, Malawi, Swaziland, and Mauritius. Alex spoke alongside the National Prosecuting Authority of South Africa on building effective asset forfeiture units, enabling legal frameworks and implementation challenges. As the only expert resource person from the UK, Alex assisted in a panel discussion of a complex corruption case scenario which explored best practice approaches to the prosecution and recovery of the proceeds of corruption. He has since been asked to assist in training investigators in Namibia conducting proceeds of crime investigations.